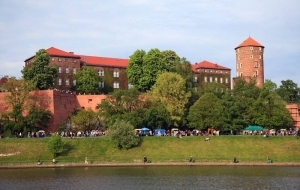 On the left shore of the Vistula, in the beautiful old city of Cracow, there is an entire complex of historical and architectural gems, including the best-known one: Wawel Royal Castle. 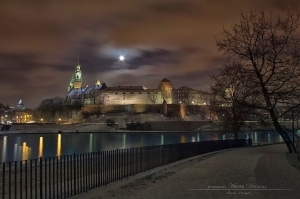 Wawel fortress was given that honourable name for a reason: for many centuries Cracow was not only the capital of the former Poland but also the centre of royal and church power whose representatives lived on this small hill. 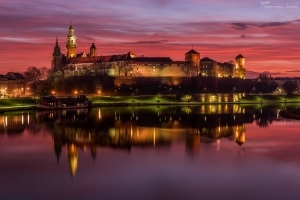 Wawel Castle, a witness of a thousand years of history of the Polish nation, is today a popular museum and one of the Seven Wonders of Poland. 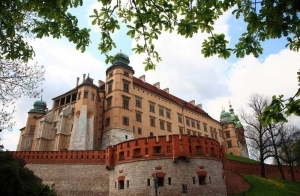 People sought shelter in the calcareous caves of Wawel hill since time immemorial, but the first hillfort of the Vistulans, a West Slavic tribe, appeared in the 9th-10th century. 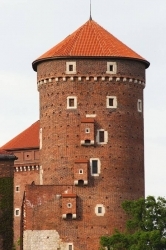 It was the foundation of the future Wawel Castle. By tradition, the duke's city was at the top of the hill, while the lowest steep part was inhabited by the plebs from Słoboda (a settlement). 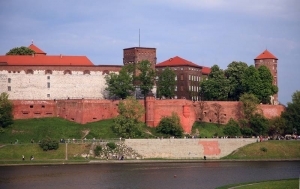 By the end of the 13th century, by order of King Wenceslaus III, the obsolete wooden fortifications were turned into stone walls that protected both the Castle and the buildings located in the lower part of the hill. 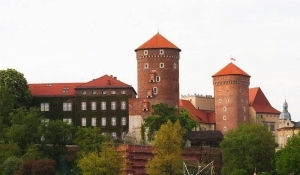 Today Wawel Royal Castle offers its visitors several huge exhibitions; each of them is dedicated to a separate theme. 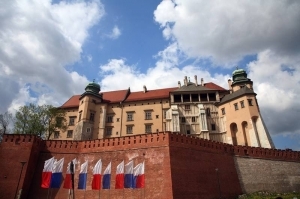 The exhibition «The Lost Wawel» tells of the castle's past which today can be admired only in the form of mock-ups or archaeological findings. You can see what the destroyed churches or towers once looked like. 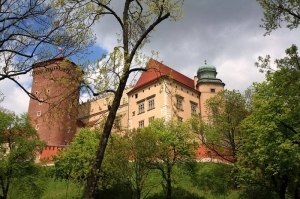 You can walk across special platforms placed over the fragments of old buildings or watch a multimedia presentation on the history of this Castle. The armoury of Wawel fortress houses a huge collection of weapons and medieval knight equipment, it consists of over a thousand items. The Crown Treasury contains valuables and unique items that belonged to monarchs; it is located on the first floor in the north-east part of the Castle. In addition, you can see coronation insignia as well as suits of armour and ceremonial dresses of Polish kings. The tour is showing us around luxury rooms which house furnishings from various periods. 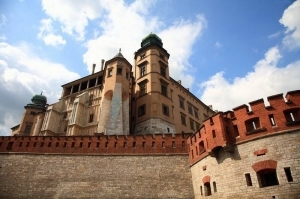 A collection of sixteenth-century Flemish tapestries, a collection of Renaissance paintings and Baroque Gobelins are considered to be one of the most valuable items in the fortress. One of the most extraordinary rooms is the Audience Hall; Sejm sessions, in which the king participated, were once held there. The original vault of the Hall, made by Sebastian Tauerbach in 1540, consists of carved panels on which are wooden heads of court and regal personages. At first there were 194 heads, but the fire that broke out in the 17th century destroyed most of them, so now you can admire only 30 of these unusual ornaments in this room. 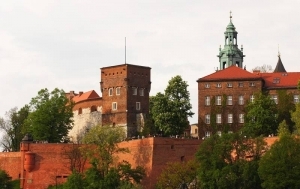 The magical stone known as Chakra is a legendary attraction of Wawel Royal Castle. The stone is buried in the north-west corner, under the ruins of the old St. Gereon’s church. It was put in this place by Apollonius of Tyana who followed God and the White Brotherhood's order. Apollonius of Tyana lived between 15 and 100 A.D., he left seven magic stones in the seven most important places in the world. These places were important for the past, present and future of the world and could never be destroyed. Apart from Wawel, these stones lie in places such as Rome, Jerusalem, Egyptian Delphi or Mecca. April - September - every day from 06:00 a.m. to 8:00 p.m.
October - March - every day from 06:00 a.m. to 5:00 p.m. 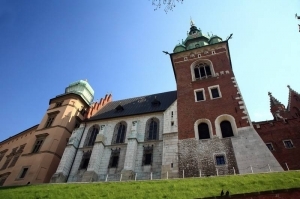 The main museums and exhibitions in Wawel Royal Castle are available from 9:30 a.m. to 5:00 p.m. (Tuesday-Friday) and from 10:00 a.m. to 5:00 p.m. (Suturday-Sunday).